Comedian Bill Cosby of New Coke and Jello Pudding Pop endorsing fame is totally excited for the new Digg 4, so much so that he can’t wait a few of weeks for its upcoming launch and needs an alpha invite like NOW. Cosby, who has been in the news recently for some interesting opinions on race, also could use the Digg founder’s help with his new iPhone app, Bill Cosby for the iPhone. Hey @KevinRose! where is my invite to the NEW Digg site? VIAGRA GOAT WEED 100% LEGAL NO PRESCRIPTION NECESSARY MEXICO. 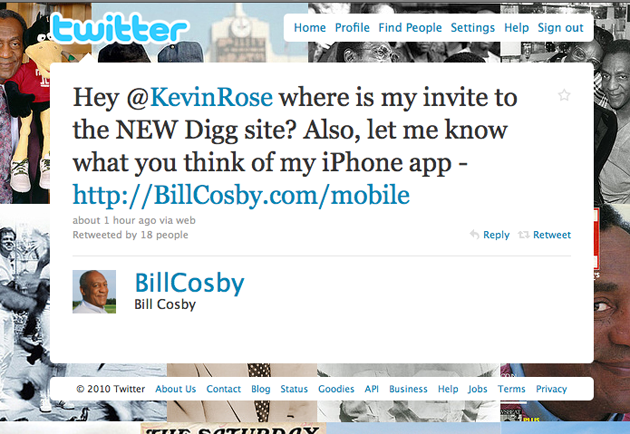 I’ve emailed Kevin Rose and asked if he’ll end up sending Cosby an invite, stay tuned for updates.